Home > Abrasive Waterjet Technology	> What Really Determines the Time to Make a Part? In comparing the performance of different Abrasive Waterjet Cutting Systems, many people assume that the one with the fastest straight-line cutting speed will also be the one with the lowest production time for making a part. That may seem logical, but it is generally not correct. Straight-line cutting speed may certainly be a factor in production time, but far more important is the way the control system moves the cutting nozzle around bends, corners and curves. The challenge in making an accurate part with an Abrasive Waterjet has always been the fact that the jet stream bends as it moves through the material being cut. As shown in the figure below, the lower part of the jet lags behind and moves differently than the upper part and that movement is a complex function of the jet parameters (such as orifice size, water flow rate, pressure and abrasive feed rate), the material being cut (what it is and how thick it is) and the geometry of the desired part. 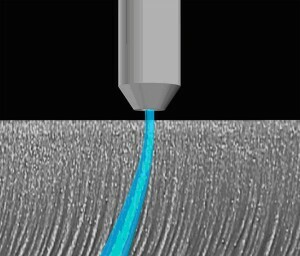 For example, to create an accurate inside corner careful attention must be paid to the rate of deceleration of the nozzle as it approaches the corner in order to assure that the lower part of the jet has caught up with the upper part of the jet at the exact instant that the corner point is reached. Otherwise the corner will tend to be washed out. Even more important, the acceleration of the nozzle as it leaves the corner must be carefully controlled to avoid the “kickback” effect that can leave a notch in the lower edge of the part and ruin its accuracy. Similar issues apply to outside corners, holes and curved sections of a part. In general, the more complex the part geometry and the thicker the material being cut, the more important the motion of the jet and the less important the straight-line cutting speed in determining part production time. Indeed, in many complex parts the nozzle spends all of its time accelerating and decelerating and never even approaches its maximum straight-line speed. At OMAX we have spent years studying and modeling the motion of the abrasivejet and have an ongoing research effort to improve that modeling and to develop control strategies and algorithms that allow our control software to optimize part production time. Our software is continually being improved and upgraded to take advantage of this research. As a result we have seen production times for many representative parts cut in half over the years by machines that have the same straight-line cutting speed that they have always had. The improvement has come from they way we move the jet, not by using expensive power to increase its maximum speed. When evaluating different AWJ systems it is critical that potential buyers do more than just compare maximum cutting speed. You really owe it to yourself to have test parts made that represent the complexity and desired accuracy of the parts that you plan to make. Then compare the production times to determine which machine is truly faster. This article is very informative. As an inspector I have seen the kerf on waterjet cut parts many times before but not until I saw the photo and read your article have I understood why the edges have the texture and pattern that is produced by this process. I also have inspected parts that are used to build your machines for many years (I work for Lukas Machine, Inc. in Seattle WA).